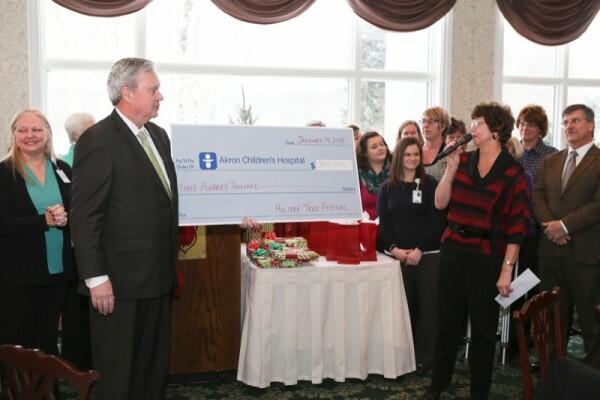 The 2014 Holiday Tree Festival raised a record-breaking $300,000 to benefit patient programs at Akron Children’s. The amount was announced at a thank you luncheon on Jan. 14 for the volunteers. Since it began in 1982, the Holiday Tree Festival has raised $5 million for the hospital. The festival is presented by volunteers, and is truly a year-long effort for those involved. Awards were also presented to members of the Holiday Tree Festival committee for their years of service. Plans are already underway for the 2015 Holiday Tree Festival, which will be held Nov. 21-29, 2015 at the John S. Knight Center. For more information, visit akronchildrens.org/treefestival.